Autumn - a time for bright colors, now riotcolors: gold, orange, bronze, yellow, red, chocolate - that's her palette. In this season of wedding is a chance to be a memorable holiday, you only need to show a little imagination. Even the autumn rain will be the highlight of the celebration, if thoroughly prepare for it. Nature has taken care of the wedding bouquet, which resourceful bride will be able to collect on their own from the fruit, ears of corn, golden leaves. With the form. Popular autumn compositions are considered "waterfall" or circle. Little girl is more suitable round bouquet and high-order brides is better "waterfall" that visually removes a couple of centimeters of growth. If there is a fantasy, then come up with an alternative form of its bouquet. Composition. This is the most important point of the wedding song. 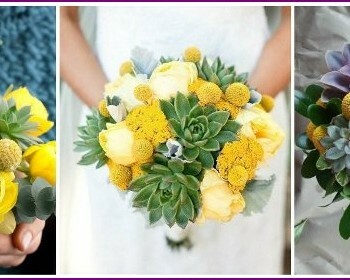 Stick to a certain range of colors to match the style of the bouquet the bride or wedding celebration. Avoid too bright, flashy colors. 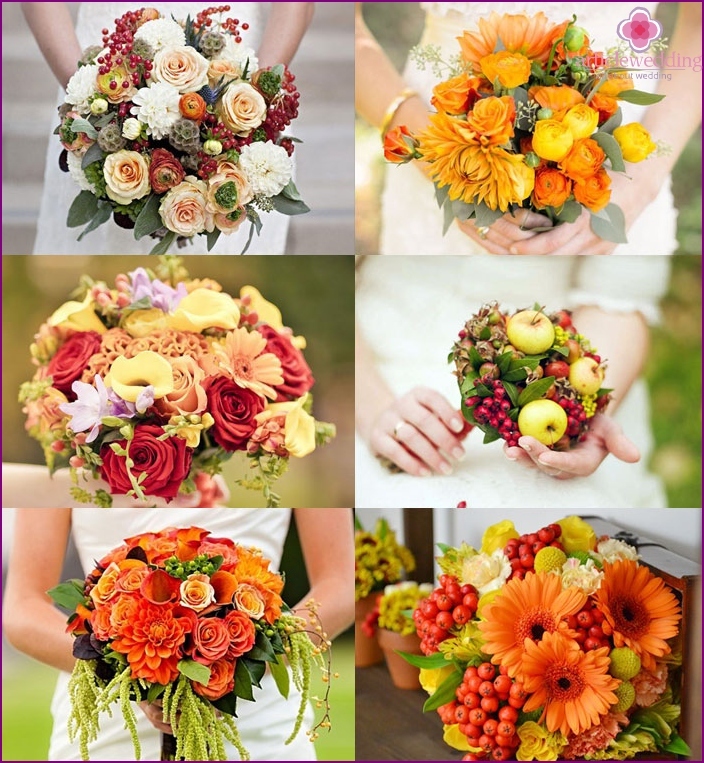 It is best when the bride stops on their favorite flowers, decorating their autumn elements. The smell should not be pronounced, or the bride's head ache. Even the most delicate flavor will cause discomfort during the day. Meaning of colors is also important, so before choosing certain colors, ask, and if you fit their symbolism. Florists say that autumn bouquetcolors should match the season. A range is very wide: terracotta, any shade of red, red, bronze, orange, yellow, burgundy color. 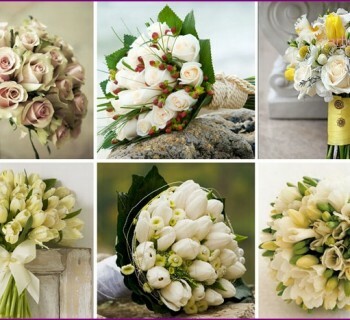 Select colors in accordance with the bride's dress and bouquet filled according to its preferences. The original color will complement dried flowers, yellow sunflowers, oak golden leaves, small red Ranetki, ripe fruit of wild rose or bunches of rowan. Let's look at a few palettes, perfectfit into the concept of a wedding bouquet. The favorites of the previous autumn seasons are called saturated blue (electrician) or purple. These shades go perfectly with all the pastel colors: cream, beige, pink, and orange or yellow. Stunning autumn color combinations - it is yellow, orange, red. 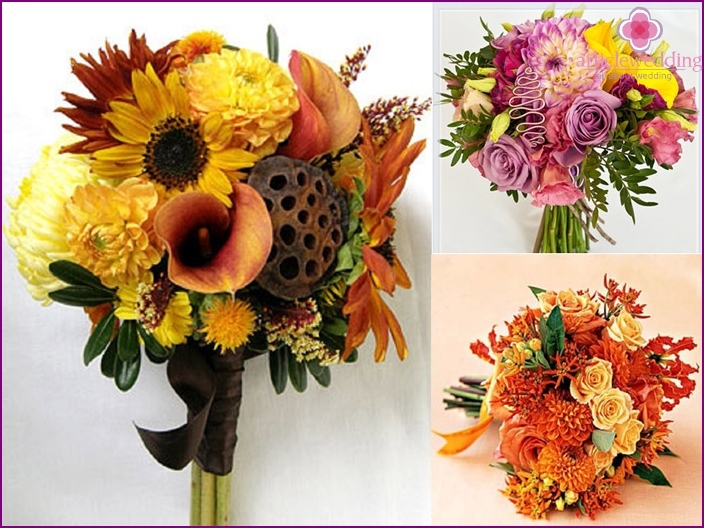 This versatile complement the wedding bouquet classic atmosphere autumn. Florists in autumn orange composition include chrysanthemums, dahlias and bright multicolored zinnias. The contrasting colors of red and greenbuilt on symbols and metaphors. This color symbolizes the dynamic duo of the seasons. It gets major summer ringing with enchanting autumn quiet melody. Successful elements of this option will anemone, aster, hydrangea. But especially good look authentic autumn composition: bouquets, gathered on ethnic grounds. Pumpkin, rowan, viburnum, sunflowers - a true and stylish. Form autumn bouquet bride is different fromany other - it should not be too bulky. If you use large flowers (gerbera daisies, sunflowers), then you need to apply them in a small amount, adding stylish decor: viburnum branches or with dried berries. Small flowers are often collected in the form of a ball, and they are suitable for brides of low growth. Girls tall order better flowing autumn bouquet, which includes large and small flowers. Round. Track-hemisphere with the correct lines. For her, often used by large roses. Ball. It is based on wire frame, which carries the stems of a variety of colors size. Through the entire structure is passed ribbon that the bride is holding or hangs on the wrist. Fan. Using the wireframe created a fan shape, which are inserted into large flowers, rhinestones, lace, fabric, feathers, beads or other decorations. Basket, clutch. They are weaved with steel wire frame, which is fixed in the buds of different sizes. This form is easy to carry in their hands, because the bride is passed into the hands of floral frame and wears it as a clutch. Vegetative in which there is a minimum of decor and are included natural elements: ears, dried berries, golden leaves, grains and even vegetables. Structural. Florists give this form of asymmetry, to get volume, successfully arranging the small flowers, large leaves and stems of different sizes. Glameliya. Fashionable shape wedding bouquet, which is created from a wire frame with rose petals, camellia or gladiolus. Threaded. It is based come from vines or flowers with long stems. The compositions are made in the form of inverted drops, arc, or a waterfall. Sceptre in which long stems and flowers of various sizes connected together. Biedermeier. Composition with round shapes and a closed loop, where the flowers are stacked rings, which are located one within the other. 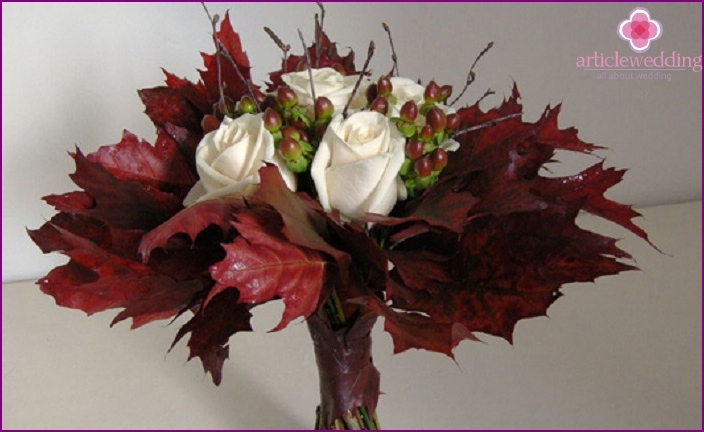 An important element in the creation of an autumn bouquetbride is the decor. As decorations used satin ribbons, plastic beads, lace and Swarovski crystals. However, the number of jewelry should not distract attention from the bride herself, so make the bouquet so that it was reasonable to create a frame for girls only. 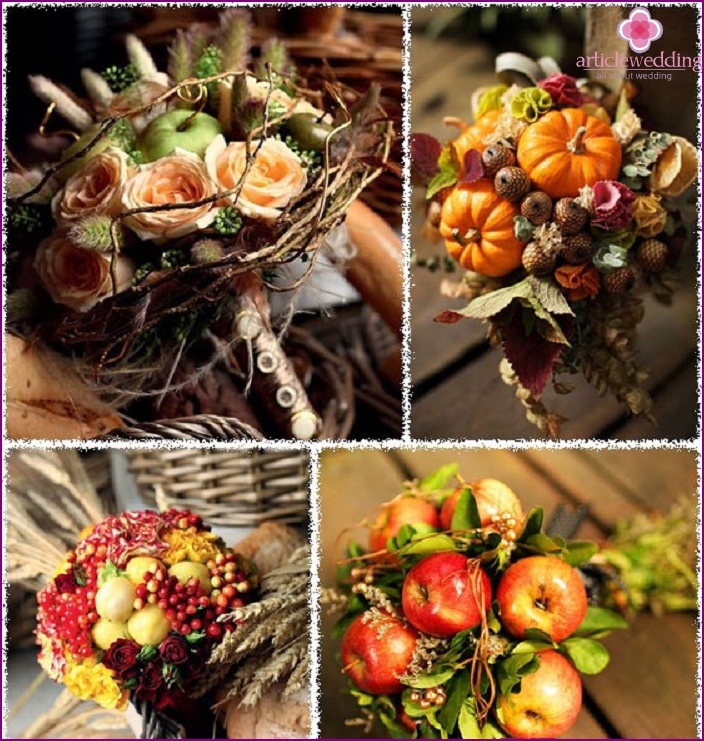 For stylish autumn bouquet florists advised to take natural decoration: sprig with berries, small apples or a small pumpkin. 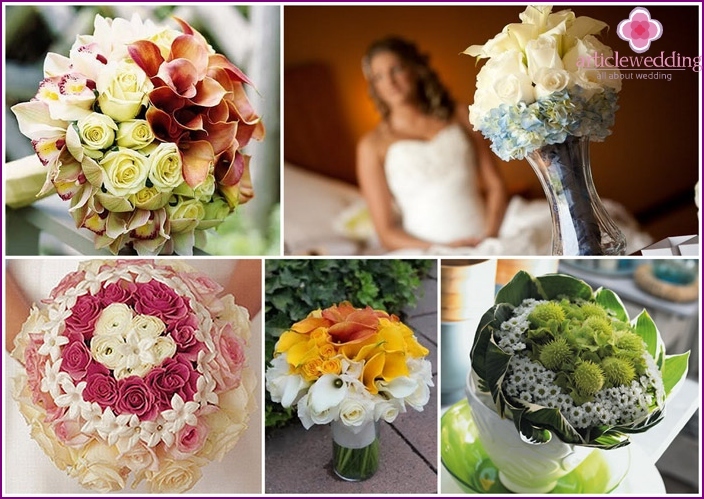 Often we see the fall of the bride's bouquet,consisting of roses, calla lilies, gerberas and large dahlias. Use of floral compositions and roses of different colors, sizes, and sunflowers flowers, which contrast perfectly with the white wedding dress. The main difference between the autumn palette is almost complete lack of greenery, but the florists wedding bouquets decorated ears dry, dry leaves of yellow or brown shades, as well as artificial leaves, beads, sequins, glitter, if you want to give the image of the bride's fabulous. 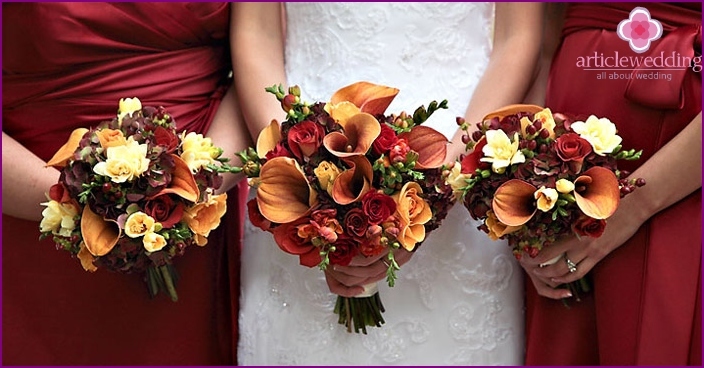 Wedding bouquet of autumn in its composition hasflowers that delight all the bright colors: calla lilies, dahlias, roses with orange, red and yellow leaves of trees. These shades are focusing on the background of white wedding dress the bride. Experiment with the texture and color of autumn leaves, combining what is considered to be incongruous - and you'll get an exclusive wedding bouquet. Original notes in the autumn will add otherosehip branches with fruits, grapes, physalis and acorns. They will fall entourage, add color and bright dry leaves a special charm. Such compositions may be combined with satin ribbons green, purple, brown, or gold. Bride with the composition of such a plan in the wedding photos will look stunning! Among the variety of flower in the brideany season prefer roses. These flowers are considered a luxurious decoration, so the flower catalogs of floral shops turn a head to any customer diversity of their species. The real hit of recent years weddings have become monobukety, combining incongruous at first glance, shades of roses: red and lavender, cream and blue, purple and blue. Choosing a floral arrangement for your wedding,Draw inspiration from nature. In the fall to replace summer pastel tones come bright colors, the game of contrasts and a riot of colors. Florists autumn bouquets used in a variety of grass, twigs, berries and leaves of different colors. Originally look cereals, which are complemented by colored beads or shiny rhinestones. 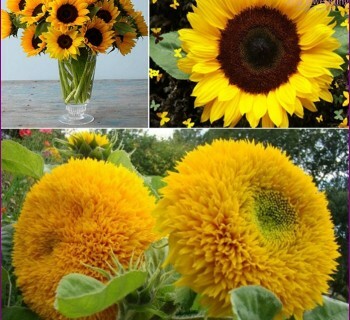 Do not be afraid of saturated colors and dense colors,choose sunflowers, asters, chrysanthemums, decorating their cones, berries and autumn leaves. The success you will be guaranteed. Apples in a frame of autumn leaves and twigs viburnum will not leave indifferent neither guests nor bystanders. 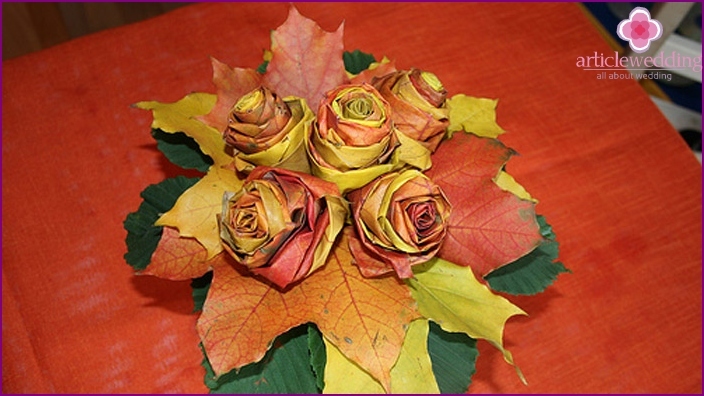 Especially creatively and boldly looks bouquet of multi-colored autumn leaves, complete with a miniature pumpkin. How to make an autumn bouquet with their hands? Putting it in a bun: rose, Bovard, berries and herbs. Floral tape is wound. We put everything on the frame, the handle wrapped with twine. We make decorative ribbon and our autumn bouquet is ready! Wedding trend this fall compositionsbecome wildflowers. They will create an extremely gentle duet with a wedding dress. Wild flowers charming, natural and organic look together. Daisies, lilies, hollyhocks, sunflowers, cornflowers, sweet peas beautifully decorated with ferns, autumn ears of grain or grass, creating the idyllic nature of wedding floristry. Some flowers that have been unjustly forgottenbefore, in the future the fall season again come to the wedding scene. This multifaceted dahlias - from luxury to simple pompons lilies, asters autumn melkotsvetnye that florists use as a composite filling. In our photo galleries you will find some examples of flower arrangements for weddings in autumn warm sand, purple, orange, yellow.